A graphic memoir about the treatment of mental illness, treating mental illness as a commodity, and the often unavoidable choice between sanity and happiness. In her early twenties in New York City, diagnosed with bipolar disorder, Rachel Lindsay takes a job in advertising in order to secure healthcare coverage for her treatment. But work takes a strange turn when she is promoted onto the Pfizer account and suddenly finds herself on the other side of the curtain, developing ads for an antidepressant drug. She is the audience of the work she's been pouring over and it highlights just how unhappy and trapped she feels, stuck in an endless cycle of treatment, insurance and medication. Overwhelmed by the stress of her professional life and the self-scrutiny it inspires, she begins to destabilize and while in the midst of a crushing job search, her mania takes hold. Her altered mindset yields a simple solution: to quit her job and pursue life as an artist, an identity she had abandoned in exchange for medical treatment. When her parents intervene, she finds herself hospitalized against her will, and stripped of the control she felt she had finally reclaimed. Over the course of her two weeks in the ward, she struggles in the midst of doctors, nurses, patients and endless rules to find a path out of the hospital and this cycle of treatment. One where she can live the life she wants, finding freedom and autonomy, without sacrificing her dreams in order to stay well. Rachel Lindsay is a Burlington, Vermont-based cartoonist. She is the creator of the comic strip Rachel Lives Here Now (2013-present), which appears weekly in Seven Days. She is a graduate of Columbia University. This is her first book. 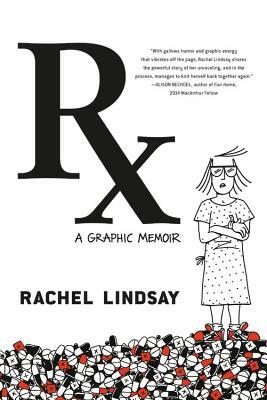 "Rachel Lindsay's graphic memoir is a powerful example of how writing and drawing about something painful and unimaginably difficult-in this case, bipolar illness-can be healing, both for oneself and for those who read it. "—Roz Chast, New York Times bestselling author of Can We Talk About Something More Pleasant?